We went out 3 of the last 4 nights and my internal 80 year old body is hating me for it. Reuben’s holiday party was on Friday and I met a whole gaggle of his new work peeps. I ate a lot of patatas bravas and churros and then ended up dancing off maybe 2 churros at a bar down the street. I felt so young and so hip… until the next morning. But I ate a lot of dumplings and rallied. I mustered enough energy to go to a friend’s cookie decorating party, without getting completely overwhelmed with social anxiety, and had enough holiday spirit to go to my office’s holiday party that night. We stayed out to 2 am, ate late night gloriously mediocre bar pizza, ubered home, laughed at all the weird things that happened throughout the night before passing out hard. Miraculously, I woke up feeling ok and desperately craving something green. I put soft pants on, scurried to the farmers market for some salad fixings, came home, ate salad, and officially melted into the couch for the remainder of the day. I had big plans of baking some cookies, but my body was like NOPE. I was hoping that spending Sunday being a blanket burrito would be enough recovery for me, but then I woke up with another big fat NOPE. The moment I got to my desk I just couldn’t wait to go back home and sleep. But then my boss asked if I wanted to go to the Warriors game that night and it took me like .00000001 seconds to say UM, YES. He has incredible season pass tickets to the Warriors. As much as I love my hometown of Cleveland, I can’t let my (lack of) hometown sports pride hold me back from insane front row (sort of) tickets. We were so close to the players, I could almost hug them. Reuben said if I tried to hug them one of the intimidating body guards would tackle me to the ground. Whatever. It was such a fun time and I couldn’t help but feel so thankful to be there. Generosity is such a great quality in people and there is just something about this season that really makes the generous spirit shine. 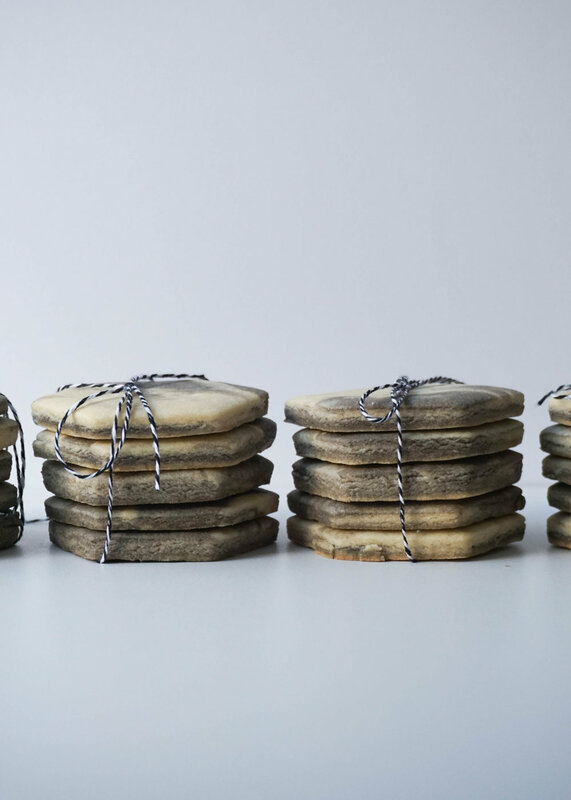 Whether it’s gifting once in a lifetime NBA tickets to your employee, or surprising a coworker with thoughtful vintage pottery (thanks, Alex and Francis! ), buying a friend coffee, or just making someone a cake. Doing nice things for each other is simply just so great, isn’t it?? I have lots of generous people to be thankful for this season, so I better get baking on all those last minute cookies! Gosh, 7 days until Christmas already?! If you’re looking to bake up a treat for the people you care about in the next week, you can either go the cookie route or the cake route. I shared a great little cookie recipe last week and this week I have one of the most delicious and festive cakes I’ve made yet! COOKIE BUTTER CAKE. Until a few weeks ago, I had never purchased the infamous cookie butter from Trader Joe’s due to fear of addiction and gaining 100lbs. But! I took the plunge and got myself a jar for the sake of recipe development. The hype is real. Cookie butter is really really good. The flavors of cookie butter in this year’s holiday cake were great because I’m not a huge fan of gingerbread. Cookie butter has a bunch of the same warming spices we all crave this time of year, but without the intense molasses flavor. Then I covered the whole cake in my true love: cream cheese frosting. If you’re making this recipe, you could totally stop right there and you’ll have a smashing good cake. Anyway, I obviously have nothing else better to do with my weekends, so I made a little sugar cookie house and matcha tuile trees. I may or may not have drafted up the elevations of the sugar cookie house in AutoCAD (for those designer nerds out there…). I took a pretty minimal approach to decorating the house and the cake in general. I just loved how delicate and vibrant the trees turned out and wanted to keep the colors and forms of the cake simple. Gosh, I sound like an architect, don’t I?? A few blobs of buttercream and gold sprinkles were all that it needed. However, for next year I would ideally like more time to dedicate to cookie architecture. Maybe I’ll attempt a Luis Barragan or Sea Ranch inspired cookie structure. I’ll add that to my list of 2019 goals and make it happen. I think this cake is going to be my last recipe for 2018. Crazy! I hope you all have a wonderful, restful, and belly filled Christmas! Whisk together flour, baking powder, baking soda, salt, and cinnamon in a medium bowl. Set aside. Place softened butter and sugar into the bowl of your standmixer set with the paddle attachment. Blend for 45 seconds at medium speed until light and fluffy. Add in cookie butter and blend for another 45 seconds until evenly mixed, fluffy, and lightly tan in color. Add in eggs and vanilla and blend until just mixed. Scrape down the sides when necessary. While mixing the batter on low speed, add in dry ingredients in 1/3rds, alternating with buttermilk in between. Mix until just combined, avoid over mixing. Grease 2 8” cake pans and line bottoms with parchment paper. Add batter to cake pans. Smooth the tops with a small offset spatula. Bake for 28-32 minutes until done. Remove from the oven and allow cakes to cool in the pans for 5 minutes before removing from pans and placed on a wire rack to completely cool. Blend together cream cheese, butter, salt, and vanilla for 1 minute on medium speed until smooth. Reduce speed to low and gradually add in powdered sugar until smooth. Scrape down the sides when necessary. Place 1 layer of cake on a cake board or plate. Plop some frosting on top and smooth out the frosting into an even layer with an offset spatula. Place second layer on top. Cover the whole cake with frosting. For the ruffle detail use a petal decorating tip (one end is skinnier than the other). Hold the piping tip at a 45 degree angle, with the fatter end touching the caking and pipe the frosting while also turning the cake stand. Top with a sugar cookie house or cut outs and matcha tuile trees! Recipes are below! - I added 1 tsp of matcha powder and formed them around a cone mold immediately out of the oven. - I omitted the tahini from my recipe and made cardstock cut outs of my house to trace on my rolled out cookie dough. Adhere the cooled cookie walls together with royal icing or extra buttercream. Hi, December! You got here real quick. Reuben and I made the innocent mistake of venturing out to the suburbs on Saturday afternoon and quickly realized that literally everyone and their mom in Daly City was out buying their Christmas trees and other holiday goodies because it was December 1st. I don't know if I've just been living in an urban bubble, but I didn't realize that holiday madness is in full swing on the 1st. All we wanted to do was run some errands at the suburban Target because the experience is so much better than the dinky city Targets, plus there are more Chip and JoJo products I can longingly gaze at. I've also been dreaming of draping garland over all the windows in our apartment! Reuben swiftly vetoed the fake stuff covered in glitter from Target, because our apartment is a strictly glitter free zone. Then the parking lot at Home Depot literally looked like hell on earth, so we gave up on the garland mission for the day. Don't worry though! We found a pile of the real deal stuff at the nursery down the street from us! (I could tell that you were worried) I bought enough to drape around 1 single window because, JEEZ, real garland is EXPENSIVE. I definitely got into the wrong profession. Back when I was in high school they did not tell us that in 10 years taking photos of your food and selling tree trimmings linked together would make you a pretty decent living. In the 3 years that Reuben and I have lived together, we have never had a Christmas tree. Main reason being because we don't really have room for a tree and we have absolutely zero outlets left to plug anything new into. Don't look at our power strips. I think all our other plant babies would be jealous if we moved them around to make room for a temporary woodsy roommate. So this one single garland strung over my mini kitchen island is a huge step up for us in the holiday department! I just got the battery powered twinkly lights too : ) so get ready! Oh! I should decorate our rubber plant with twinkly lights! I'm semi nervous that the next month is going to fly by extremely quickly. I'm doing my best to slow down and savor the holidays. I'm making time to bake all the cookies, work on this year's holiday cake (it's going to be a good one! ), listen to the few select Christmas songs I can tolerate, and be extra extra cozy at home. I miiiiiight even be able to convince Reuben to watch Love Actually with me this year!!! I'll let you know if I succeed. To kick off the next month of holiday baking, I'm sharing this ultra moist and decadent Persimmon Bundt Cake with Cream Cheese Filling. IT. IS. SO. GOOD. The recipe is actually based on Reuben's mom's Apple Cake. I've swapped out the apples with persimmons and added the cream cheese because you can eat all the cream cheese you want this month. I've had it once before when we were in New Jersey and it was amazing! It's one of Reuben's favorite desserts for a reason. When I was testing the recipe, I asked Reuben if he's ever watched his mom make it for him. He said no, because she would either make it early in the morning before he woke up, while is was at school, or the day earlier if he was coming from college. At the moment, I was like "Ah! I wish you had some idea if I was doing this right!". But once the cake was baked and it got Reuben’s seal of approval, I was thinking how magical and appropriate for the season his experience of never actually seeing the cake be made was. Like, how great is it to wake up in the morning with the smell of cinnamon and sugar baking wafting through your house and then realizing you're about to have cake for breakfast?! Or to come home from college for Christmas break and to be greeted by your family a slice of your favorite dessert in the kitchen?! Ugh, my heart. Those kind of memories, especially ones tied to delicious smells, are the ones that stay with you forever and then when you're 31 and don't live close to your parents anymore you ask your baker girlfriend to make you're mom's recipes. Carefully remove the stems from persimmon and cut into 1/2” cubes, skin on. Place cubed persimmons in a large bowl and toss with white sugar. Set aside and allow to sit for 30 minutes. Make the cream cheese filling. Cream the cream cheese with sugar using the paddle attachment on your standmixer or with handheld beaters. Mix for about 1 minute until smooth. Add in egg and salt. Mix until combined. Set aside. Whisk together eggs, canola oil, and vanilla in a medium bowl. Combine flour, salt, baking soda, brown sugar, and cinnamon in a large bowl. Give it a quick whisk to combine. Add wet ingredients to dry ingredients and mix together until combine. Mix in persimmons until they are well dispersed in the batter. Batter will be really thick. Grease a bundt pan with non-stick spray. Pour half of the batter in bundt pan. Scoop cream cheese filling in the center of the batter ring. Add in remaining cake batter. If the batter almost fills your mold, don’t worry. The batter does not dome up too much. Place in the oven and bake for 75-80 minutes until done. Test for doneness using a clean toothpick or knife. 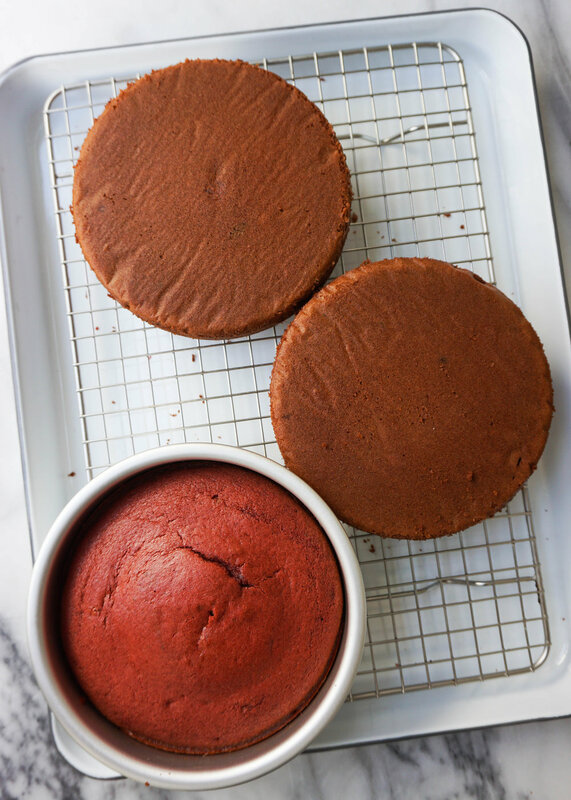 Allow cake to cool in the pan for 10 minutes. Then invert the cake pan onto a wire rack. Cake should fall out of the bundt mold. Allow to completely cool and then enjoy! Heyyyy! How was your holiday break? Have you gained 20 pounds from cookies? Do you feel rested and ready to take on 2018? I baked a billion cookies, a cake, and a dozen pineapple buns. Impressed my Grandma with my baking skills and she now believes I can actually cook. Watched Coco with my family and tried to not ugly cry in public the whole time (THE MOVIE WAS SO GOOD AND BEAUTIFUL). Started watching The Crown and got my brother hooked on Riverdale (it's so terrible but so good). It has been great! I'm wrapping up my time at home and flying back to San Francisco tomorrow night. Leaving my parent's house is always so bittersweet. Whenever I go home I always feel like a part of me reverts back to my 18 year old self, which is good and bad. Back in San Francisco, I'm a real self-sufficient and independent adult that can take care of herself. But when I'm home, all of a sudden I melt into the couch and my mom takes care of everything for me! So grateful for her. As relaxing as my time at home has been, I'm ready to get back into my normal routine and to see Reuby again! I miss my tiny kitchen, too! 1. Eat more vegetables and drink more water - Pretty basic, but after all the indulgence the last few weeks I'm contemplating going vegetarian for the month of January and sort of miss going to the gym... who am I?!!! 2. Cook more of the food that I love - that includes noodle soups, dumplings, and buns! I'm super proud of all the recipes I've cranked out this past year, but I feel like there was a severe shortage of noodles and dumplings. Gonna change that. 3. Don't let Instagram get to me - To be honest with you guys, I've been developing a lot of anxiety while scrolling through Instagram. It wasn't always this way. But lately, I feel myself comparing myself to other accounts, feeling insecure, and unsure of what I want to share with the world. I don't like feeling that way, so I just have to keep reminding myself that we all have our own story to share and that the point of Eat Cho Food is to cook food that I love! Resolution #2, ya know?? 4. Visit my family more - It gets harder and harder to be away from my family each year that I am away. So I've been trying to squeeze in more trips home every year. I'll be working on a project in Chicago the next few months, so I'm hoping to make some weekend trips from Chicago to Cleveland work out! Need to bake some more buns with Cho Momma! 5. Connect - This is a constant resolution for me. But I always want to work on my connections with people. Reuben. My family. My friends. You. It's hard when people are scattered around the world, but it brings me a lot of joy to connect with a far away living friend, even if it is a short phone call! For my last recipe of 2017, I'm sharing my favorite comfort food. Noodle soup. I crave it when I'm sick. When I'm sad. When I'm tired. When I feel like celebrating. Heck, all the time! My mom can make a mean noodle soup out of anything. The random ingredients left in our fridge. Or the leftover pot roast that needs to get eaten up. 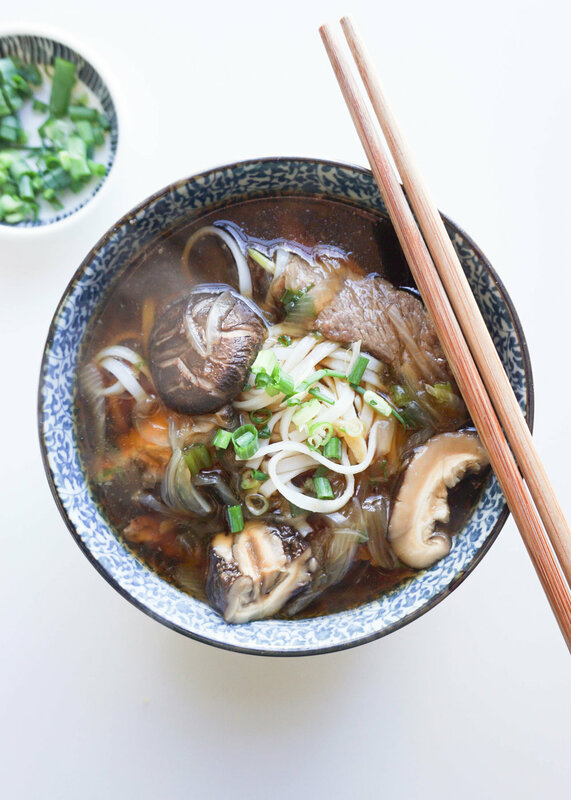 This noodle soup has a super rich and deep broth made up of shiitake mushrooms and beef. The mushroom broth is made by steeping dried shiitake mushrooms in hot water. You can get dried shiitake mushrooms at most asian supermarkets. If you're soaking mushrooms for a stir fry or a non soup dish, never throw away the broth, it's way to valuable to waste! Freeze and save it for the next time you need some quick soup! This noodle soup is nourishing and comforting. After all the cookies, cakes, and meaty feasts, this is the perfect simple bowl of food to start your new year off with! 1 package of rice noodles - prepared according to packaged directions. Leave noodles in a strainer and tossed with a bit of oil to keep the noodles from sticking. 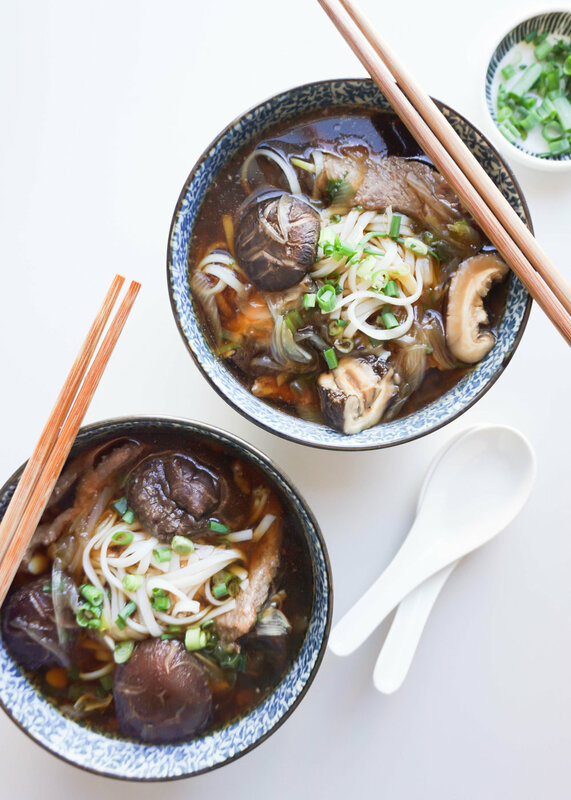 * You can make this vegetarian by swapping out the beef broth for vegetable broth and the steak with tofu or bok choy. Place the dried shiitake mushrooms in a heat proof container and pour boiling water over them. Make sure the mushrooms are submerged. Cover with a lid or plate and set aside for 30 minutes to allow the mushrooms to soften and steep to produce your mushroom broth. Combine the steak with oyster sauce, 1 tsp salt, 1/2 tsp white pepper, and oil in a bowl, container, or ziplock bag. give it a good mix and allow the steak to marinade for 20-30 minutes, while you prepare your soup. Thinly slice the garlic cloves and chop the green onions. Peel and slice the white onion in half and then thinly slice into crescents. Set aside. Once the mushrooms have soaked, remove the mushrooms and either cut them in half or leave them whole if they are small enough. You can also slice them if that is your preference. Strain the mushroom broth through a fine mesh sieve to catch any grit. Set aside the broth and the mushrooms. Add the beef broth, mushroom broth, sliced garlic, onions, white of the green onion, salt, white pepper and dark soy into a pot and bring to a boil. Once boiling add the mushrooms and bring the heat down to a simmer. Allow to simmer for 15-20 minutes. Taste and adjust flavorings according. To prepare your steak, add a bit of oil into a skillet and bring up to a medium high heat. Sear the steak for 3 minutes on each side for medium rare. Cook for longer if you prefer your meat cooked more well. Remember that the heat of the soup will cook the steak a little more. Place the steak on a cutting board and allow to rest for 3 -5 minutes. Thinly slice the steak. 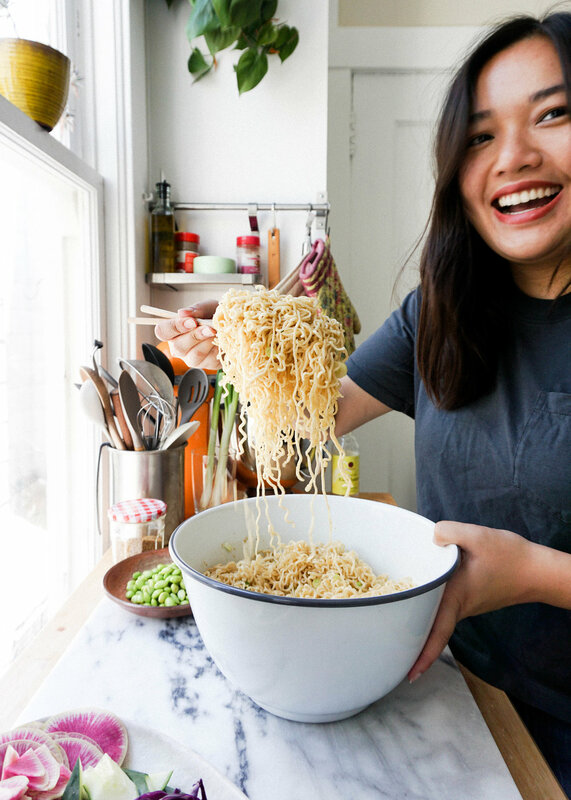 To assemble the noodle soup bowls add a bundle of cooked rice noodles into a bowl. Place a few slices of steak on top and ladle your soup over the noodles and steak, making sure the grab a few mushrooms. Garnish with the green onions and enjoy! I'm home! After a painfully early (and chilly!) arrival this morning and a desperately needed 5 hour power nap, I found myself back in the normal rhythm of life with my family. Isn't it funny how that works? No matter how far away you live (2,458 miles to be exact) or how long it's been since you've been home, you just effortlessly slip back into life as if you were never gone. It only took about 2 minutes after I got up from my nap to find my spot on the couch, the corner spot that fits all the lumps and bumps of my body perfectly. I'm looking forward to the much needed sleep, lounging, eating, snacking, family seeing, present opening, and maybe some Cleveland sight seeing in the next week. I wish you all safe and smooth holiday travels to wherever y'all are going! Try not to let the stress of holiday air travel bring the evil out of you. Okay, let's get to the cookies! There's 3 more days until Christmas, which is plenty of time to squeeze in some cookie baking time for Santa. These Marbled Tahini Sugar Cookies are freaking delicious and are so gorgeous! 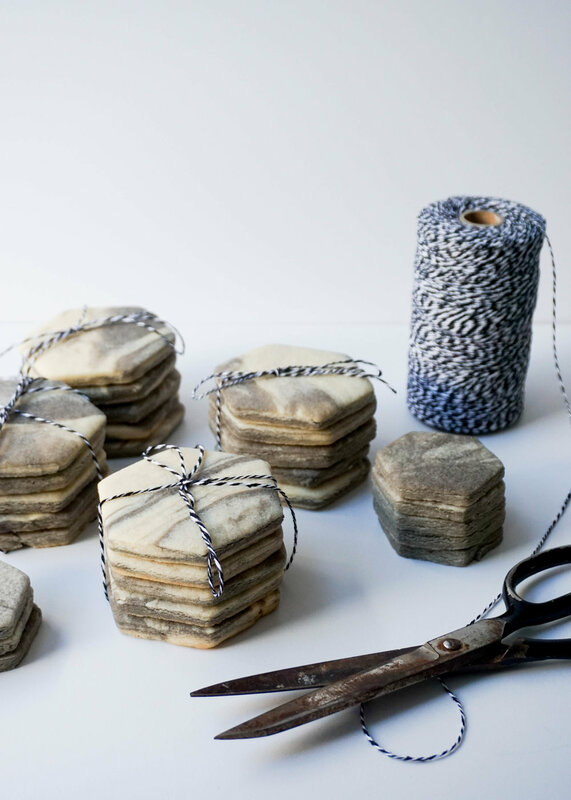 They would make the perfect gift for someone who would prefer a more edible gift rather than a stack of marble coasters. That would be me. The cookies are soft and chewy, like a good sugar cookie should be. The tahini gives them a beautiful nutty flavor that would make you never want a regular old peanut butter cookie again. 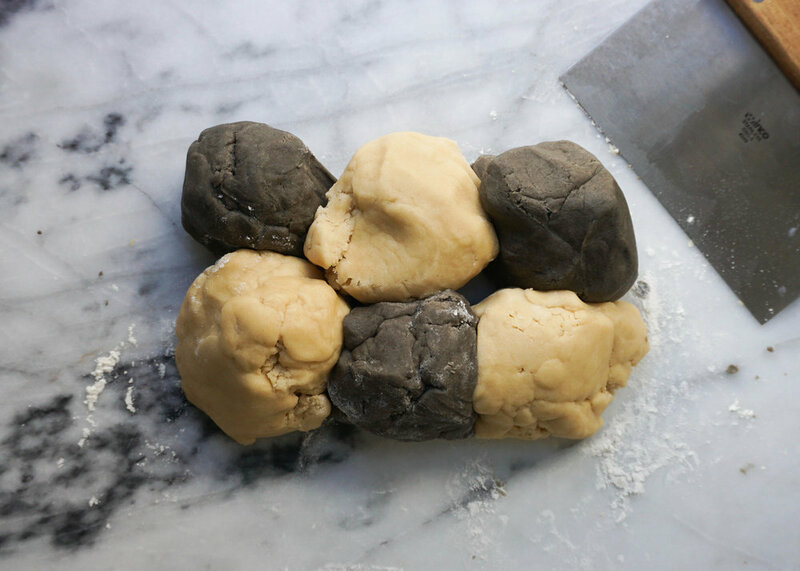 Black tahini is what gives the cookies the the dark vein in the marble. Have you tried black tahini before?? I love it so much. I might be imagining it but I think the black sesame seeds taste worlds better. But that just might be my love for all things black sesame talking. I was embarrassingly gleeful when I saw the cookies come out of the oven. 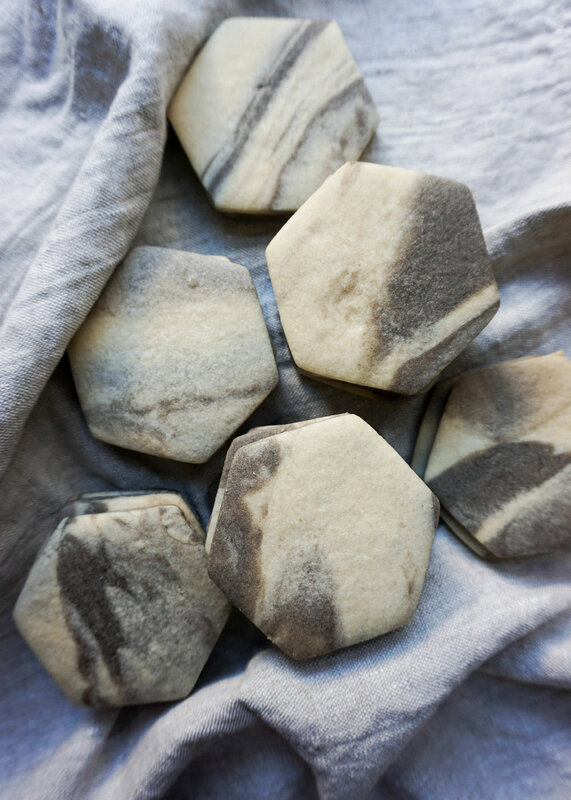 I loved how they looked so much and wanted to tile my whole bathroom in tahini cookies! You probably already know this, but I work as an Architectural Designer/Interior Designer by day. I've spent countless hours looking at tile samples. I think I can safely say that these cookies look way better than a lot of tile out there. 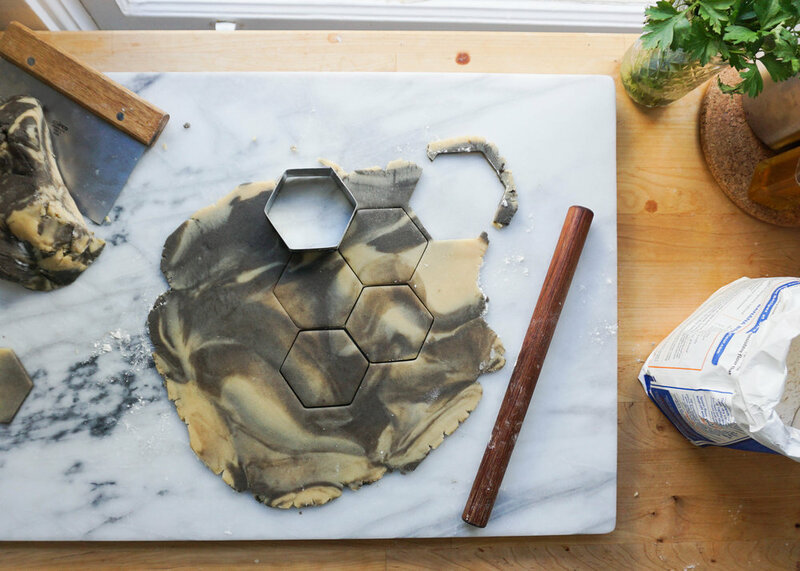 I have dreams of making more of these tile cookies with different colors! Chocolate! Matcha! Turmeric! Strawberry! So many Options! There will be a whole line of Eat Cho Food Tile Cookies! Maybe there will even be coordinating buttercream grout color options??? 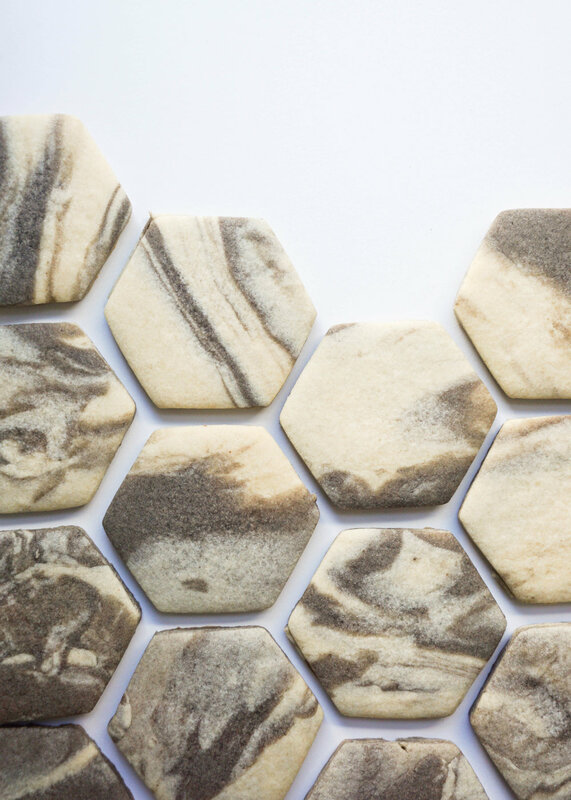 I could say a lot of really architect-nerdy things about the specification options for this tile cookie right now, but I will spare you the boredom. Oh! and if you're interested in these hexagon cookie cutters, I got them here! In the bowl of your standmixer or with an electric beater, cream together butter and sugar until light and fluffy, about 5 minutes. Add in egg and vanilla until combined. Scoop out half of the dough into a bowl and set aside. Add in regular tahini into the remaining half of dough and beat until incorporated. Place in a small bowl and cover with plastic wrap. 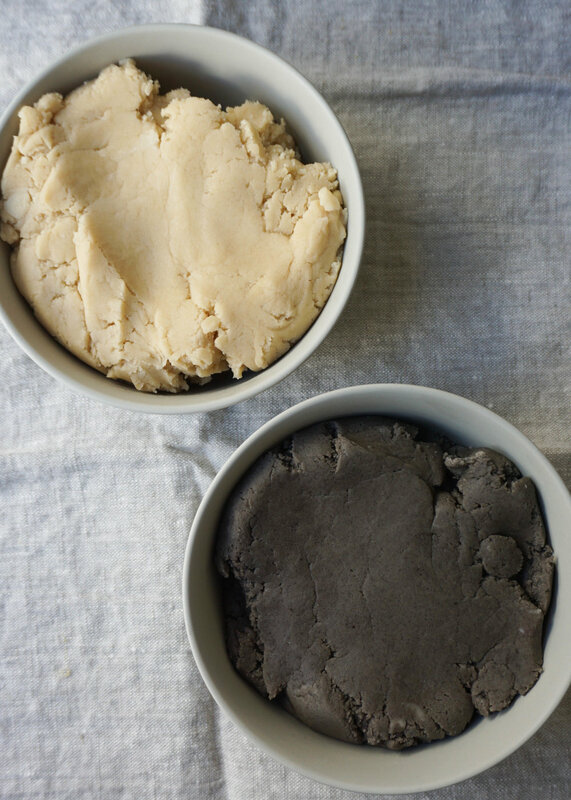 Do the same with the other half of dough, but add the black tahini instead. Place in the fridge to chill for at least one hour. Chilling the dough helps the cookies keep their shape. Roll out the dough until it is about 1/4" thick. You can divide the dough in half if it is easier for you to work with that way. Lightly flour your cookie cutter and cut out your cookies. recipe was based on this great Food52 recipe! I feel about as plump and round as that marzipan snowman. My weekend consisted of wine, tapas, ice cream, Chinese food, papusas, cookies, and fried chicken. Ooof, I just grossed myself out making that list. And I'm not even home for the holidays yet. Aaaaaaah! Where is my smoothie?! Reuben's parents are in town and we have been living our best lives and eating all the best foods. Plus my office has been getting inundated with so many sweets. Free macaroons and vegan donuts are hard to pass up. But I'm dying for a big platter of vegetables and to not think about cookies for a while. But I'll push through all the sugar and make it to 2018, ready for all the green foods! Until then, I'm going to try to enjoy all the gluttony (in moderation) this holiday season has to offer. It doesn't snow here in San Francisco, obviously. The low is about 50 degrees. There are definitely not carolers strolling. Market Street has some holiday lights up but it still smells like poo. And there are maybe 2 houses around us that have any holiday decorations up. Being a child of the snowy Midwest, I just want so much more out of my holiday season. I want to bundle up in as many layers a possible so that you could confuse me for the Michelin Man. My hair should freezer a few times. I want to sip on hot cocoa everyday. I want to walk outside while the snow is gently falling from the sky. I want to be snowed in so that I'm forced to stay bundled up inside putting together a puzzle or paint all day. We don't have a Christmas tree this year or a fireplace to hang stockings on. It's just not the same here and it makes me feel a little blue. Since the holiday spirit in SF is not up to my satisfaction, I decided to make my own snowy winter scene! In my new favorite medium: cake. Plus, when you're an adult, you learn to fix your own problems instead of wallowing in sorrow, right? Cake fixes most things I think. I brought this cake to a little holiday gathering in Stinson Beach a few weeks back and everyone loved it! No one had the heart to eat Mr. Snowman though. If you're looking for a show stopping holiday cake, this is it! And it's pretty darn easy. I'm not really into elaborate cake decorations. Mainly because I ain't got no time and I haven't practiced my buttercream flowers nearly enough. With a few extra ingredients and some creativity, you can create a magical winter scene with little stress. This is a naked red velvet cake with coconut cream cheese frosting. The coconut milk gives the frosting a nice tangy flavor. The red and white is a nod to some holiday colors. The pine trees are inverted rosemary sprigs and the snowman is made of marzipan rolled in powdered sugar. Then the whole thing gets hit with a severe powdered sugar snowstorm! It was really fun to put together and brought back a ton of architecture school memories. I would spend hours, days really, buildings models. It was torturous but also oddly relaxing. I would put on headphones, queue up a good (or terrible) show on Netflix, and spend the next billion hours cutting and gluing things. Thankfully I don't have to do that anymore! Anyways, happy holidays and I wish you all safe travels to wherever your going! Off to Cleveland tomorrow! Eeek! 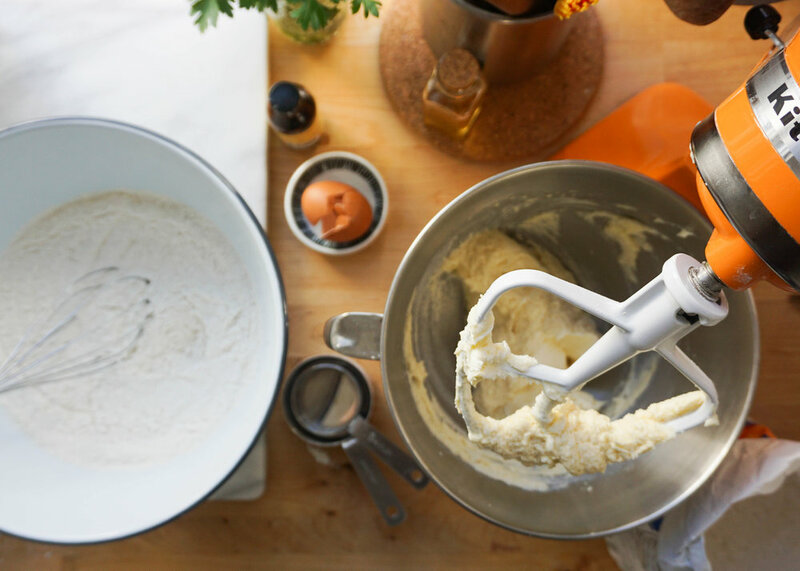 Whisk together cake flour, baking powder, baking soda, and salt in medium bowl. In the bowl of your standmixer with the paddle attachment, cream together butter until creamy. Add in sugar and beat until light and fluffy, about 3 minutes. Beat in 1 egg at a time until fully incorporated. Carefully pour in your buttermilk and red food coloring and mix again. Slowly add in the flour mixture, scraping down the sides when needed, until the batter is evenly mixed. Line the bottoms of three 6" cake pans with a disc of parchment paper and grease the sides. Equally divide the cake batter into the cake pans. Smooth out the top with an offset spatula or spoon so that they are leveled. Bake for 20-25 minutes until a toothpick inserted into the center comes out clean. Remove from the oven and allow to cool in the pans for 5 minutes. Carefully remove the cake from the pans and allow to completely cool on a wire rack. Whip together cream cheese, butter, coconut milk, powdered sugar, and salt until light and smooth. Place in the fridge for 20 minutes to set up. Level the cake tiers, if you wish (eat the scraps!). Plop some frosting on the first layer and smooth over with an offset spatula. Add enough frosting so some of it slightly overflows at the edges. Repeat steps with the remaining layers of cake. 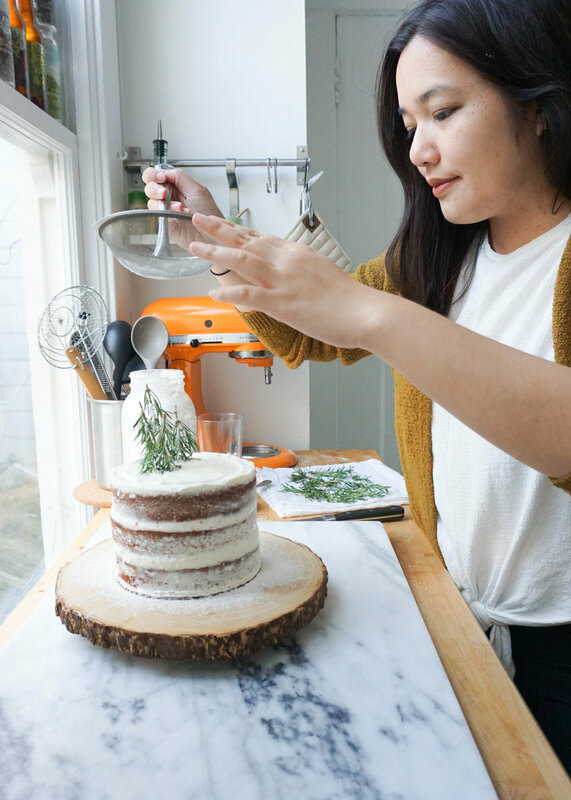 Frost the top and scrape the edges of the cake with a bench scraper for the naked cake look. 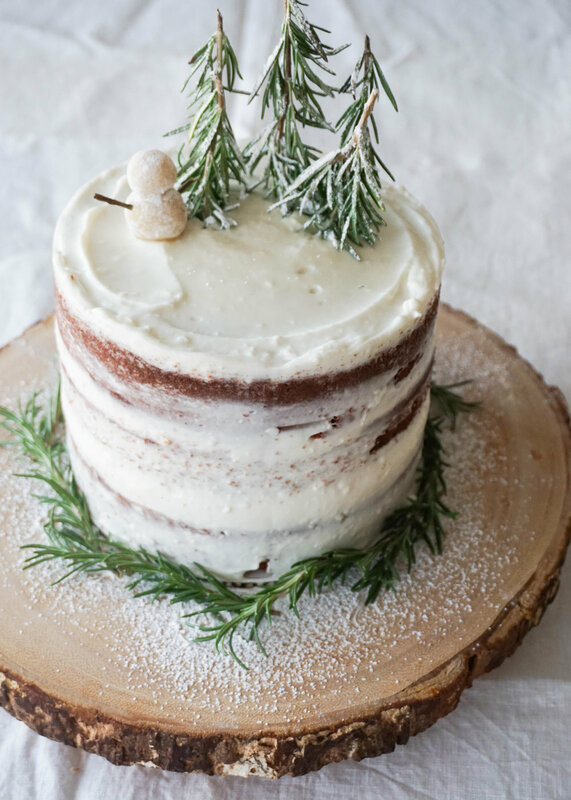 Decorate your cake with powdered sugar snow, rosemary trees and garland, and a happy marzipan snowman!